I got the updated version in the github link mentioned below. Worked just fine, no problems. What a great mod. This is how I'm going to play from now on. To compare, I tried running Skyrim with Window's built-in "Windows Sonic for Headphones" which does the same sort of positional effect. No comparison. The audio quality from this mod was much better. I get a weird issue where the sound direction is mirrored. so sounds that are coming from my right are heard in the left ear, and vice versa. and no, my headphones are not backwards. i got it for skyrim vr but no matter what i do it say "no game data on top level" how do i fix it. note i am new to this. If you're using Mod Organizer 2, reread the mods page. It says not to install this with a mod manager and do it manually. I get you're new but you have to read over the mods installation instructions. So, as visual studio 2017 came out since this mod was released, is it better to use that rather than visual studio 2015? having a problem in Skyrim VR even with the newest version on get hub with the "VR fix" where it'll work fine for a while and then randomly become backwards as in sounds on my right are heard on my left. and the same for front and back. Edit: even after downloading his most recent version on github, I ended up uninstalling and my audio is pretty good now, I can hear where sounds are coming from, not as clearly obvious as when the mod was working for the 5% of the time that it did, but its a better overall experience. I am having the same issue in VR so i'll be uninstalling as well until there is a fix. Thanks for posting your issue. Unplugging and replugging your HDMI and USB for your headset should fix the problem. NOTE: This mod is outdated, but there is a link below this comment that people are sharing which contains an updated version. A game-changing mod that I would recommend to anyone playing this game. The world feels more alive when you've got this mod, and I absolutely love it. Is there any reason to try a newer version from there? The original uploader is too lazy to manage this mod, so the version on here is a severely-outdated version from 2016. Only problem is, this page has like 100x the traffic that kosumosu's own github has so hundreds and hundreds of people are using an inferior product. You should definitely use that August 2017 version, as it fixes a number of bugs and has better compatibility. I seem to be getting a lot of crashes related to X3DAudio1_7.dll, do I need VCRedist 2015 specifically? I keep installing it but I want to keep 2017 version because I need it for other games as well and 2015 always seem to be getting over written by 2017 vcredist..
Not sure if this is a help or a hinder to you, but I was trying to figure out why my game has been crashing weirdly too. I used to have the mod files from here and even tried the newest files on github but still I was random crashing. I found this info on Audio Overhaul for Skyrim and maybe it is relevant to you in some way, or to anyone who may be trying to figure this out. At least for me it has worked once I deleted these files. I'm stable again. Not saying this is true for anyone but me, just some feedback. Q: I'm crashing with True 3D Sound for Headphones? Is there an incompatibility? A: Currently there is an outstanding issue when using the combination of True 3D Sound for Headphones, Alternate Start - Live Another Life, and Audio Overhaul for Skyrim SE. When starting a new game with all of these mods enabled, the game will crash to desktop when loading the Alternate Start cell. While the mod is unsupported by AOS, it is recommended you disable T3DSH by renaming the hook file "x3daudio1_7.dll", start a new game, finish setting up your character, and then renaming the hook file the mod after you are finished. 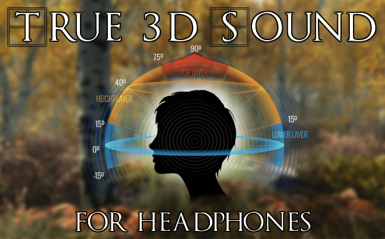 Please read the compatibility notes for an explanation as to why True 3D Sound for Headphones is "unsupported." First, this is a very nice mod. Thank you. Probably to create a sense of direction and distance. Just like reality, any sound you hear near you will be clearer and better heard than the ones from afar. Problem is vanilla sounds are compressed, hence they sounded worse (they sound better when blended with other sounds so normally, we wouldn't notice). So I used https://www.nexusmods.com/skyrimspecialedition/mods/17035/ to replace the vanilla english voices files with new ones, in much higher quality (192kbp/s in contrast to approx. 48kbp/s vanilla ones). They became a lot better (and louder so you might want to tweak the voice setting in game). Might as well replace your vanilla music with better version using either https://www.nexusmods.com/skyrimspecialedition/mods/4968 (install manually) OR even better https://www.nexusmods.com/skyrimspecialedition/mods/19782 . I tried experimenting with new vanilla game and noticed that during the sequence, the voice of Gen. Talius sounded near to me even though he was far from the cart. Turns out someone else had solved this. Turn off all your audio enchantments (untick all of them) in Windows. In my case, Loudness Equal. was on. Though I find tweaking my EQ and leaving it on make it sound better. I am no expert at audio. Just your average user. Turning off audio enhancements is a good idea, as well as unticking "Give applications exclusive control of this device". The mod uploader (CptYouaredead) really should update this mod to have the newer version from August 2017 as well as a FAQ that addresses common bugs like this, but it seems like he hasn't active here since Christmas of 2016. I thought about uploading my own version that would be better managed since X3DAudio HRTF is licensed under GPLv3 and can freely be redistributed, but it would seem petty and I would probably get accusations of plagiarism from stupid people. You should see about committing to the github. Oh no, I didn't mean my own version of the X3DAudio HRTF wrapper. I meant my own NexusMods page with the 2.3 version of the mod and better upkeep. It seems like the author of this mod has abandoned all 3 of his mod mirrors, and it's a real shame considering that managing a mod page is as easy as hitting the "Tracking" button at the top of the page. I wouldn't think it would be that bad, it would be more of a service to the community imo and save a lot of people figuring this stuff out on their own. As I didn't know about the github release initially. Could have the title be suffixed Update 2.3 or something. It mentions a 30% performance increase which for me is vital since this wrapper cuts my framerate in half in some games. This also works in GTA V and Left 4 Dead 2. I've used it online in l4d2 and haven't been vac banned. I'll try GTA Online soon. You uh, you go by the username "DtN7" on Youtube by any chance? @badkrma All you need is the x3daudio1_7.dll and hrtf sub-folder to be placed in the same directory as the game's executable. The technical explanation is that any .dll file from another location (like "redist" or "system32") that an application requires to run can be overwritten if a file of the same name is placed in the same directory as the executable. A lot of mid-2000s games used things like dinput8.dll or mss32.dll in order to inject mods into games. WOW I have used this before, but i just reinstalled this game with this mod and the best headphones I have ever owned. I just did a comparison and this is no small effect. It makes an absolutely amazing difference.